Engineered airflow. Patent pending outlet design ensures even, broad-path airflow for fast, consistent drying across all surfaces. Multiple operating positions. 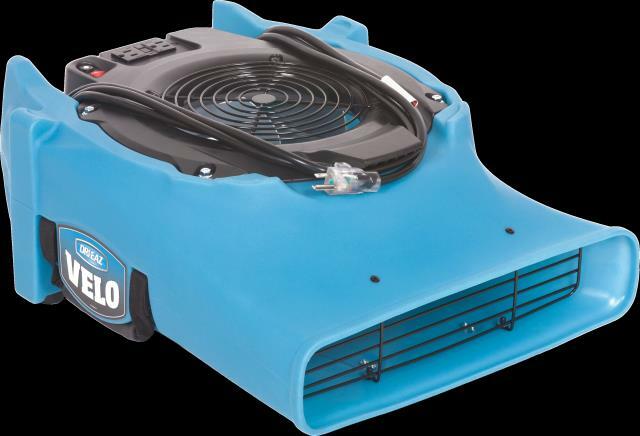 Dry floors, ceilings, walls and stairways quickly and efficiently. Low profile. Half the height of snail shell dryers and 25% shorter than competitive models. Stackable for compact storage - save space on the truck. Great portability. 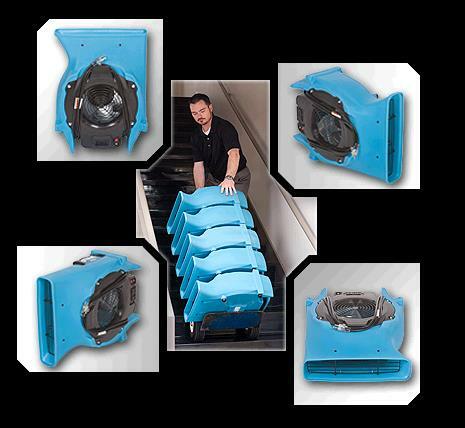 Easily carry two units at once - or stack up to six on a handtruck. No more awkward lifting, no more banging up hallways and doors. Daisy-chain with GFCI outlet. Use up to 6 units per 15 amp circuit for a whopping 5400 CFM of tested - not rated - airflow. Durable. Rugged rotomolded housing with new easy-carry handle - laboratory-tested to lift four times the weight of the unit 5000 times without failure! * Please call us with any questions about our dryer velo flat carpet rentals in Lake Charles and Moss Bluff LA.